The FMVA™ financial modeling certification program is a globally recognized training program that covers accounting, Excel, financial modeling, finance theory, Excel, PowerPoint, and business strategy. The certification is issued by the Corporate Finance Institute® (CFI), a world leader in professional education and designations for financial analysts. 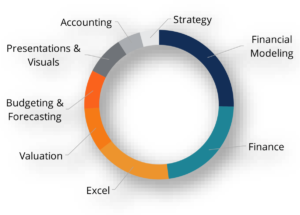 The FMVA financial modeling certification program covers the most important topics required to become a world-class financial analyst including accounting, finance, budgeting, forecasting, financial modeling, business valuation, presentations, and strategy. 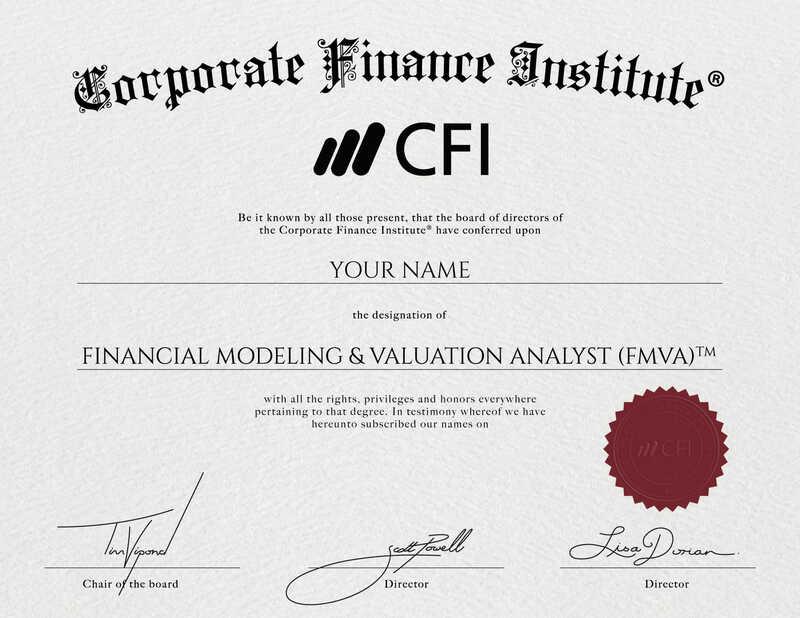 Learn more about how the FMVA financial modeling certification program from the Corporate Finance Institute can help you advance your career at https://corporatefinanceinstitute.com/certifications/. Below are the most frequently asked questions about the certification program. We recommend about 100 hours to complete the full financial analyst training. The FMVA program is flexible and allows you to study at your own pace. Please see the “Curriculum” section for recommended study hours for each course. CFI is also a recognized continuing education provider by the CPA Institutions in Canada and the National Association of State Boards of Accountancy (NASBA) for CPE credits. Will these courses help me advance my career? Based on reviews from thousands of students, we know how CFI courses and FMVA certification program have helped so many people advance their finance careers. Our training is designed to be extremely practical and simulates the experience of being trained as a professional financial analyst – the ultimate way to advance your career. Can I download and edit the financial modeling templates? Yes! You can download and edit the Excel models and templates included in your courses. Please note that the video lectures can be accessed from any device with an internet connection, but cannot be downloaded. How long does it take to receive my digital FMVA certification? Your FMVA certification will be processed and emailed to you within 24-48 hours upon successful completion of the program requirements. Individual course certificates are emailed instantly. This website is dedicated to organizing and administering the annual CFI Financial Modeling Case Competition for thousands of contestants each year. By entering the competition you will be challenged to take a Confidential Information Memorandum (CIM) and build an Excel model to value a company. Contestants must then create a short presentation outlining their recommendation to invest or not invest in the company. By using a case approach, contestants will experience a real-world scenario and be challenged to build their own valuation model from scratch. The 2018 competition has $10,000 of cash prizes to be shared among the top 3 finishers.